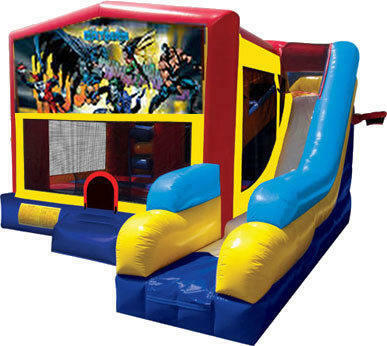 The Batman 5-in-1 combo bounce house features everyone's favorite caped crusader, Batman. This oversized bounce house is sure to attract guests young and old with some of Gotham's most famous villains. Children can bounce, go through horizontal and vertical obstacles, play basketball, climb and slide!